By now, we’re halfway through the year and hopefully you’ve settled into our monthly blog post format, with weekly features on instagram. With these new monthly posts and features, we’re all being a little pickier as we have one month of thrifted finds to squeeze into a handful of features. If you are new here (first, hi! I am glad you’re here! ), let me explain just what #thriftscorethursday is. We want you to participate! Hit up your local thrift stores, craigslist, yard sales, estate sales, side of the road, anything! Thrifty doesn’t necessarily mean from a thrift store. We want to see your good deals, wacky finds and treasures and how you style them in your home. That’s right… I am looking for gorgeous photos of interiors with your finds styled to perfection. Don’t feel like you need to save those finds for Thursdays! Yes, features are shared on our blogs once a month and Instagram weekly on Thursdays, but we’re all checking in on (and using!) the hashtag all week long. So, when you see/find it, feel free to share it! And we love it when you tag your friends to play along, too! 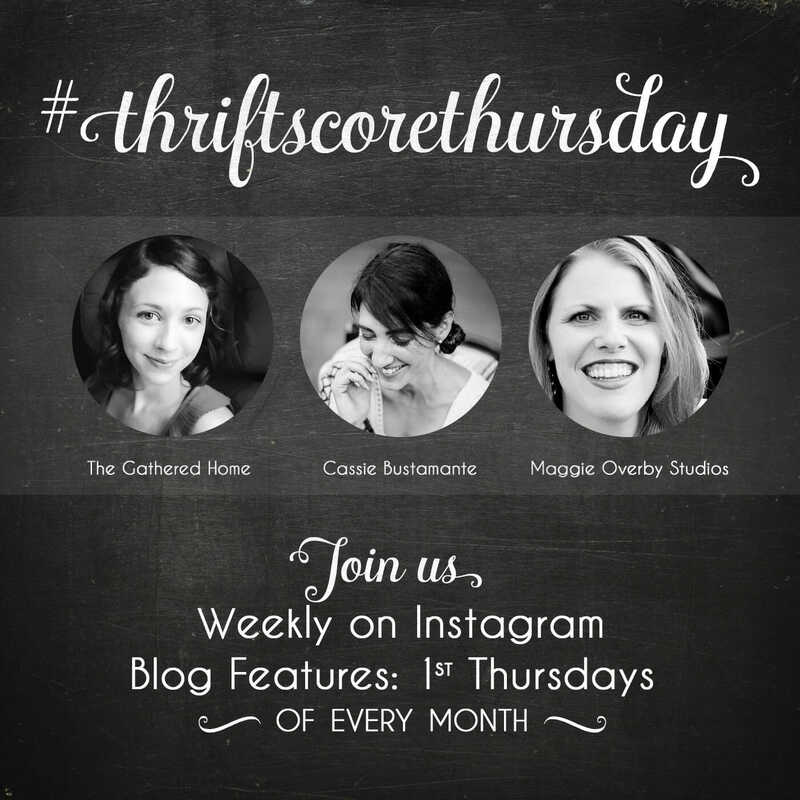 The first Thursday of each month, Brynne from The Gathered Home, Maggie from Maggie Overby Studios and I will pick our favorite thrift scores to feature. So please note that by linking up with#thriftscorethursday, you are giving us permission to share your finds via social media or on our blogs. 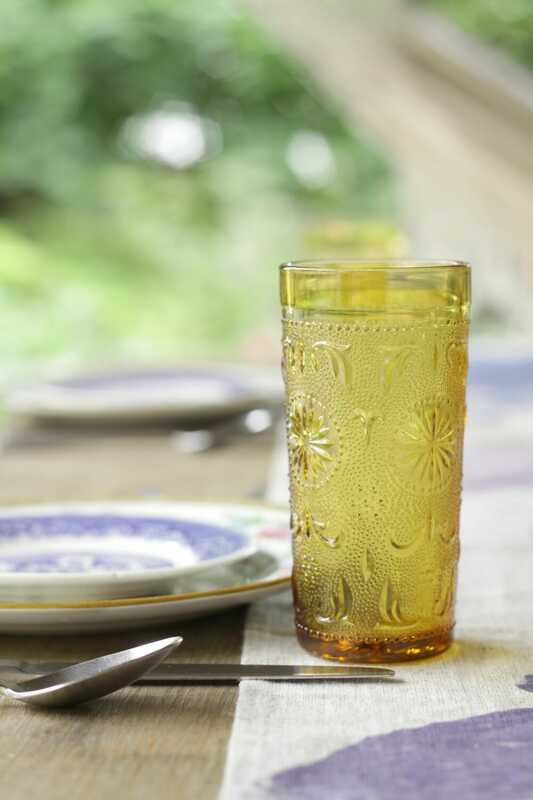 This week I am stoked to share with you a little sneak peek of my summer porch tour which is coming next week as it features my find… these amber glasses! I popped into my local Goodwill a while back and found them for $.49 each, and scooped up all 12. Those details had me swooning! And I love that they are actual drinking glasses versus goblets, although I do love goblets! These just have a more casual vibe, yet still have fun fancy flair. I set my entire table with thrifted dishes, minus the silverware we’ve had since we were married. 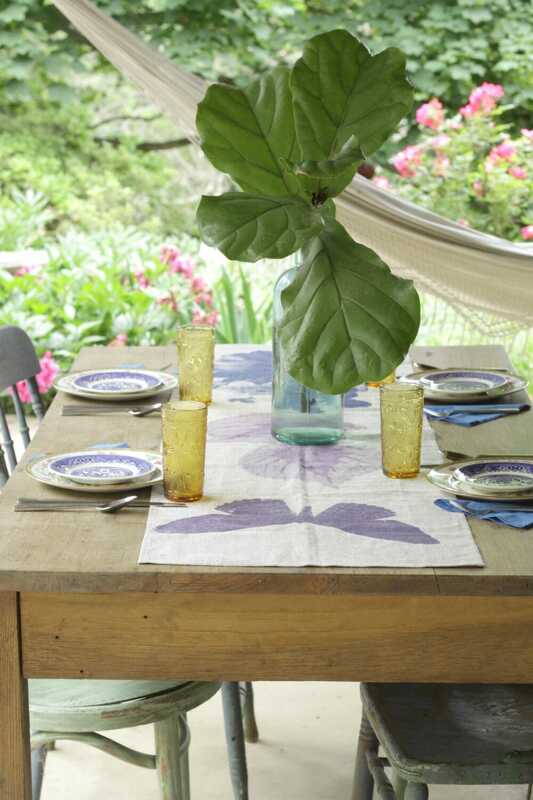 The rest pf the summer porch and gardens will be coming to the blog next Wednesday! Now let’s get to the features! I have one from each of the earlier weeks of the month, and 3 from this past week because you guys blew it out of the water. A good floral gallery wall is always a winner to me. Kelly at Street Flea has one sweet wall, and I love the dresser it’s centered around, too! Now the next three you’ve already seen on my instagram feed this month, but they are so good you should look again! 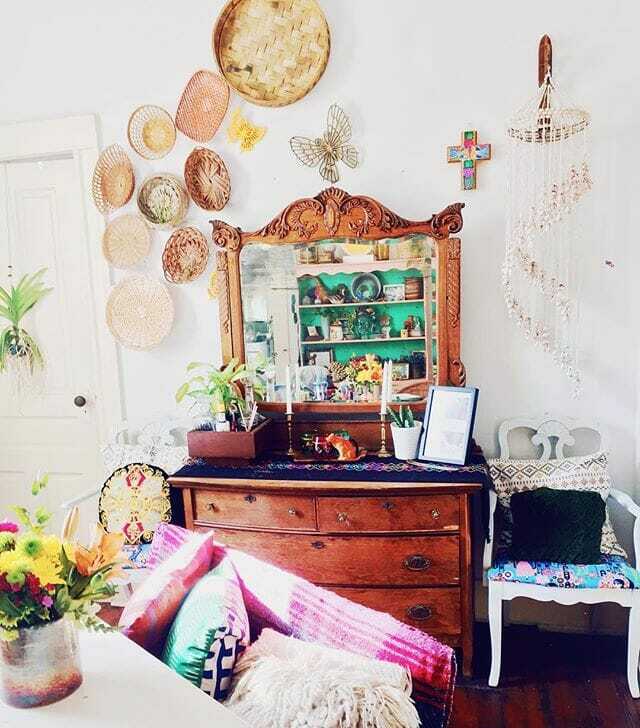 Anita who owns this space with a fantastic thrifted chair also started a blog you will want to check out. 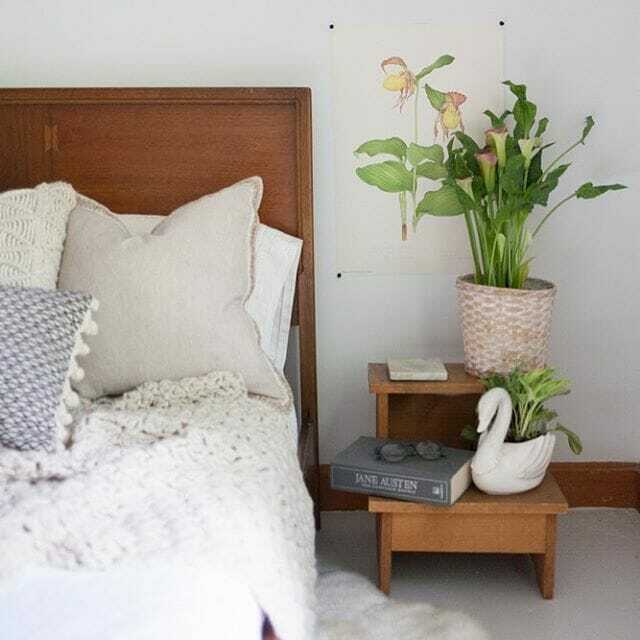 Jessica at Hunt and Haven showed us this restful retreat, filled with thrifted vintage goodies. I love the details on the headboard., and she shares 2 more styled versions of this space on her blog. And lastly, I started following Augusta, AKA The Thrifty Hippie when I saw this dresser scene. It just made me feel happy, as does her entire feed! It’s a breath of fresh air. What do you think? Are you feeling inspired? And are you feeling the summer vibes? Because I am! Now head on over to visit my cohosts to see what they’ve found and featured this month. Just click on the images below to get there! « HUMONGOUS YARD SALE TOMORROW! Love those amber glasses, they look great in you outdoor dining room, and of course that gallery wall is all me! Yes, totally feeling inspired!!! I can’t wait for the weekend so I can hit up all my favorite thrifting haunts! i haven’t had the urge, but who knows! Cassie your outdoor table looks so pretty, I can’t wait to see more of that space next week. Love the amber glasses! thank you, lisa! i love spending time out there. Loving the features! So much pretty!! Always inspired by everyone’s finds! Can’t wait to see your porch tour!! Loving your amber glasses a lot and .49 cents! Total score! Love all your features, thrifted decor is the best decor! right? i was thrilled!!!! and yes, it is! We had those amber glasses when I was a kid! I wonder if my mom still has any of them. they are just so pretty! i see a lot of goblets, but not a lot like that! it’s always hard to choose faves!